I have been with NRA/CRE since 2003. I am drawn to adventures and wild places and guiding up north certainly fulfills the criteria! Guiding has allowed me to experience some very special places with very special people and I am fortunate enough to have paddled the Nahanni, Horton, Mountain, Coppermine, Burnside, Thelon, Tatshenshini, and Soper Rivers in our beautiful country. In the off season, I spend as much time in the outdoors as possible and dabble in different areas that allow me to return to the North each season. 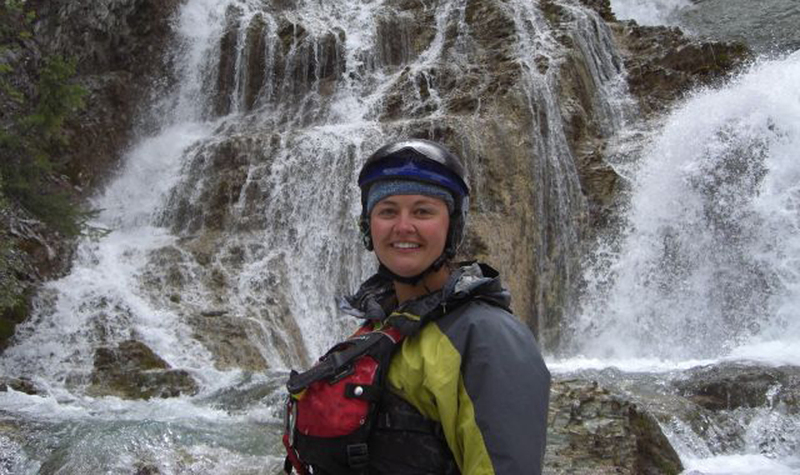 In the past I have been a Flight Attendant, Substitute Teacher, and Sessional Instructor of Outdoor Education at the U of A, and most recently I am an RN at the Canmore Hospital and an On-Call Firefighter with the Town of Canmore. Adventure is always on my mind and has led me to skiing trips in Norway, canoe adventures with family and friends to the Nahanni, Hood, Kootenay, Churchill Rivers and the Bowron Lakes, multiple hiking trips including a solo hike this past summer over the Akshayuk Pass and recent dogsledding adventures near the Hoarfrost River in the NWT. My favorite thing about guiding and the outdoors in general is the simplicity. Rain comes when it does and you put on your raincoat, if you see a hill you want to hike then you go and do it, you pack up your boat every morning and let the natural course of the river carry you downstream (…). To be able to live simply and see these wonderful places is a wonderful gift and one that we can return by lending our voice when they are threatened.